Patent Tracker surveys the current state of US pharmaceutical intellectual property. Use it to determine when drugs will lose patent protection and which companies/indications are facing patent cliffs. There are four ways to filter patents: by company, individual drug, disease, or mechanism of action. 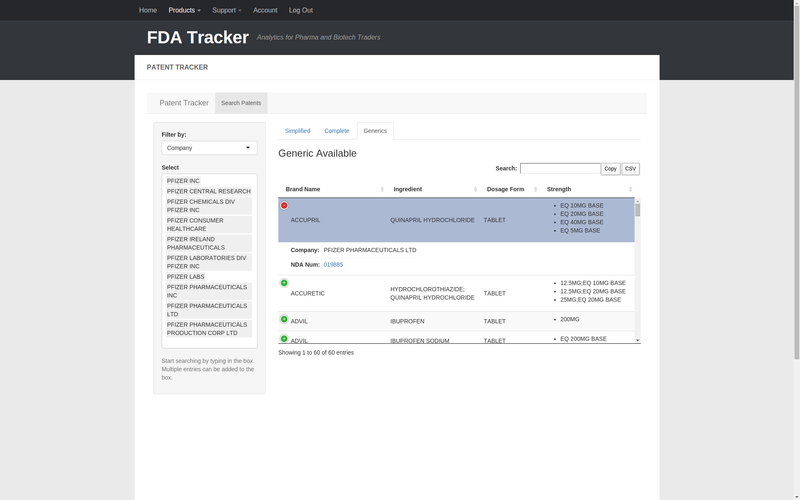 The company and individual drug data comes directly from the FDA Orange Book. The disease and mechanism of action data come from the National Drug File – Reference Terminology (NDF-RT). Let’s choose Pfizer and all of its legal entities. 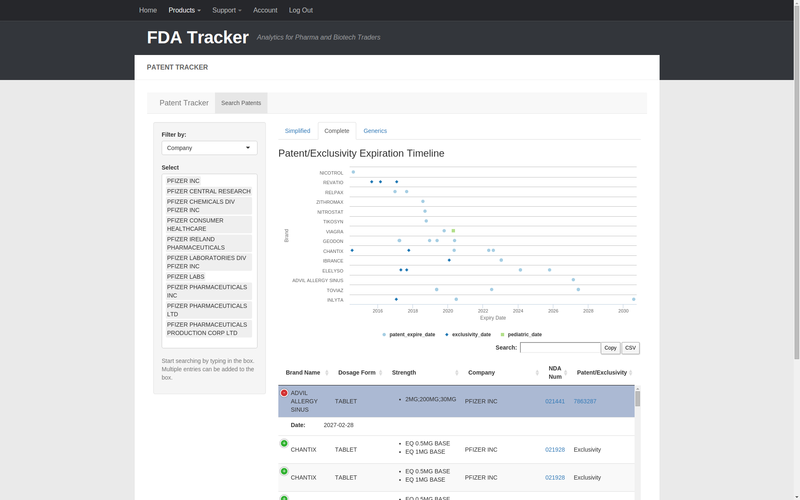 In the simplified view, the timeline shows the earliest date when a drug can lose patent or exclusivity protection. Ordering the chart by earliest expiration allows us to visually spot patent cliffs (e.g. 2018 and 2020). Clicking a point will take you to the appropriate page on Google Patents. Beneath the graph is a table listing the associated drug info and patent/exclusivity loss dates displayed in the timeline. 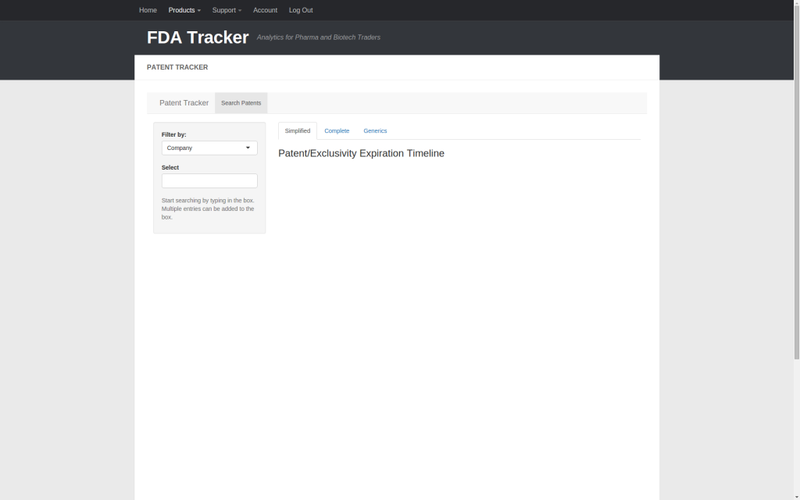 Switching to the Complete tab, the timeline expands to show all patent/exclusivity/pediatric extension dates for each drug. The information table also expands to show individual dose information with links to the appropriate New Drug Application (NDA) on fda.gov. Finally, the Generics tab shows all drugs made by Pfizer for which a generic is available. 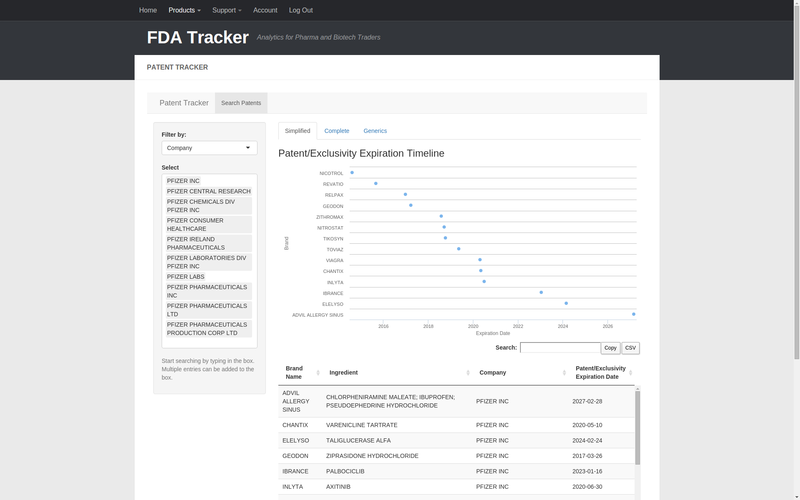 Patent Tracker only contains drugs listed in the FDA Orange Book. One major limitation is that the Purple Book (the Orange Book equivalent for biologics) does not contain patent information to include in this database.